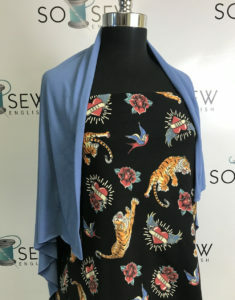 After doing pretty good about not buying fabric for the past several months, I broke down yesterday and bought a So Sew English bundle. 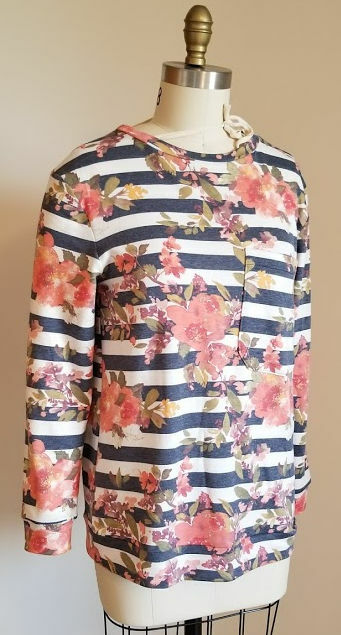 In all fairness, it was a print that I had my eye on (an it’s cotton spandex, so it’s a lot more versatile) and it was on sale (with code BBB20), so how could I pass it up? Although full admission, I already have a different tattoo print in my stash – I just thought this version looked more masculine and maybe could be used for Easton at some point. I also broke down and bought a new pattern: Made 4 Mermaid’s Bridgette and Victoria Bundle. I couldn’t resist the cute bralette and figured that I may as well give the cheekies a whirl too – although they remind me a lot of Jalie 2568 (I guess I can compare the two and see which I like better). That also means that a trip to Needle Nook is in order so that I can pick up some stretch lace to work on these! This entry was posted in Uncategorized on January 31, 2018 by stacy. Apparently, my (current) favorite pattern is Jalie’s sweatshirt (3355), because I have managed to make it again…. this time in Easton’s size. Event though this is predominantly a women’s pattern, it is also listed for boys so I figured I would give it a whirl. I gathered up some French Terry that I had purchased last year at Joann’s and traced off a size O – this is one size up from what he generally wears, but he likes his sweatshirts “roomy” and I figured this would last him another year unless he goes through a big growth spurt. 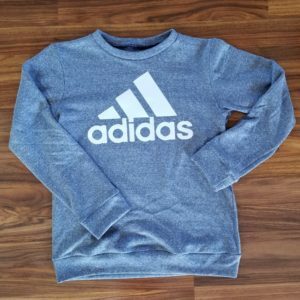 Since I opted to sew this sweatshirt entirely in the French Terry, I wound up lengthening the cuff, hem, and neck bands to accommodate the fabric’s limited stretch. While this fabric does have quite a bit of stretch over all (although not as much as a rib knit), the recovery is so-so and I figured stretching it that much would make the final shirt look terrible. 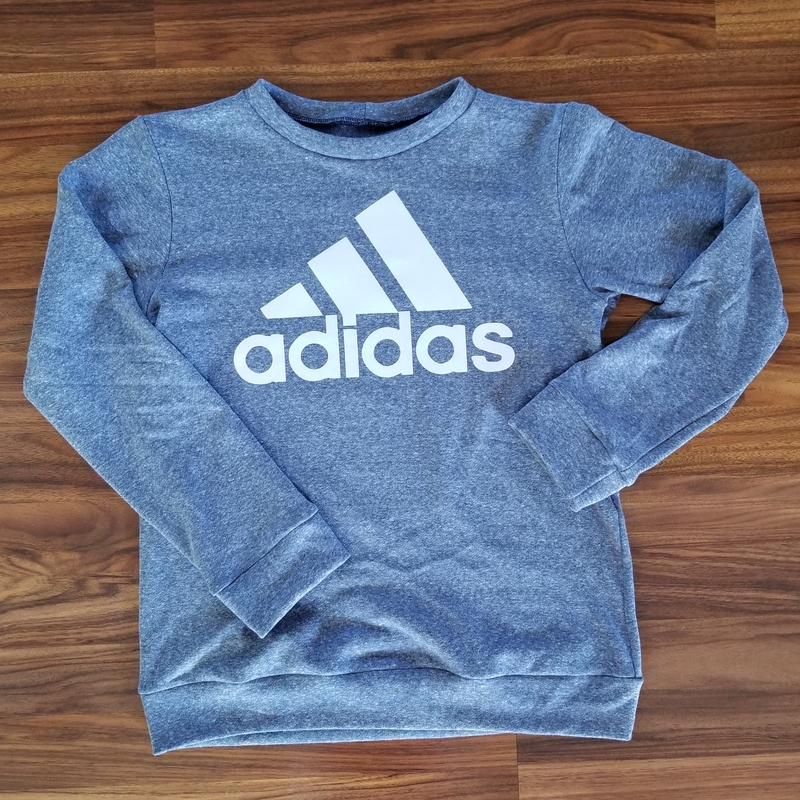 Once I was finished with construction I added an adidas logo with my Cricut (a quick Google search will give you vector logos for a lot of brands that can then be added to Design Space) and a flocked vinyl. This was my first time trying out the flocked HTV and I am pretty sure I did it all wrong. For one, I cut too deep so I couldn’t weed out any of the excess…. it just popped out! Consequently, I wound up having to transfer the design to a transfer tape, flip it over and then use a second transfer tape to attach it to the shirt. Once it was pressed, it did adhere and peel nicely, though. My only disappointment is that the vinyl isn’t more “plush”. This entry was posted in Uncategorized on January 30, 2018 by stacy. I’ve spent much of January doing various pattern testings – which means I can’t show you an entire project just yet. However, I can give you a little peek to part of a pattern that will be released this week. 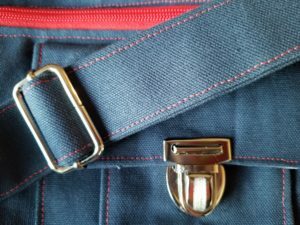 Let me just say that this project has so many great details, but was still easy to sew. You can snag the hardware kit for this one at Emmaline Bags (this is what I used for mine), but need to be a member of the Bag of the Month Club to pick up the pattern on February 1 (the pattern will be released later in the year if you’re not interested in joining the club). More details on this project on Friday! This entry was posted in Uncategorized on January 29, 2018 by stacy. Germs have invaded our house – not only do we have some sort of gastro-virus circulating (think the bathroom scene from Santa Clarita Diet), but Taylor has been diagnosed with Influenza B (even after getting the flu shot… twice). Needless to say, sewing\blogging\etc. has been on the back burner. But I can’t leave you without a few good sewing links to tide you over until next week. So without further ado, a belated Linky Thursday! Speaking of germs, if you’re feeling under the weather, chances are you’ll need some supplies to carry around like this travel tissue holder, hot water bottle cozy, or this face mask (so you can look fashionable when you have the flu). This Valentine’s Day Pillow kit is the perfect way to add a bit of the holiday’s to your home… and you can win it here! This sleep shirt is so easy to make, you’ll have it finished in time for bed tonight. This band is perfect for keeping hair out of your face, as a neck cozy\scarf, and yes even around your face to keep germs at bay (I’m all about the germs today if you can’t tell). These felt envelopes can be used for all sorts of fun Valentine projects, but I love how they’re incorporated into a fun wall hanging. Are you a Sherlock Holmes fan? Then you’ll definitely want to grab this women’s version of his famous trench. Keeping your pins handy while sewing will be as easy as pie when you stitch up this fun Cutie Pie pincushion. Get ready for Valentine’s Day and whip yourself up a fun, peek-a-boo window treat bag. This entry was posted in Uncategorized on January 26, 2018 by stacy. If you entered to win the phone case wristlet last week, then today is the day you’ve been waiting for…. The winner is Elizabeth Molleur! If you didn’t win this time, have no fear, they’ll be more fun giveaways soon! In the mean time, you can check out how to make your own tech cases in the latest issue of CME. This entry was posted in Uncategorized on January 22, 2018 by stacy. It’s not too late to enter to win my wistlest that was featured in the latest Creative Embroidery Magazine. Corgis are already cute, but they’re even cutter when they’re made into a stuffie. Have a sleepover in your\kids’ future? Then sew them up a custom sleeping bag. It’s slouchy but still fashionable: The Batwing Sweater. Why buy a shower cap when you can make your own fabulous version instead. Need the occasional storage cube for organization, but don’t have the space to store it when not in use? This version folds flat so it can be easily put away! Add a little glam to your wardrobe with this sparkle & shine infinity scarf. 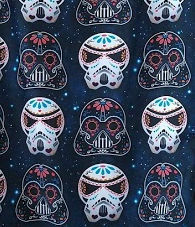 Win a 5 yard bundle of fabrics from Ink & Arrow. While you’re there be sure to check out this cute Quilted Pillbox pouch. Learn how to sew a girl’s midi dress…. without a pattern! Have a vintage print, but don’t want to cut into it just yet? Learn how to recreate it and sew it into a pretty pouch! This entry was posted in Uncategorized on January 19, 2018 by stacy. Have you started your Tech Totes yet? If you haven’t gotten the latest issue of Creative Machine Embroidery yet, you probably missed it. Want your own, but don’t have time (or an embroidery machine) to make one? Now here’s your chance to win your own wristlet! 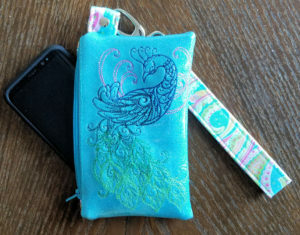 This is the same sleeve that is featured in current issue: It is made of a teal sparkle vinyl, embroidered with Urban Threads Preening Peacock design, has a removable strap and zippered closure, and measures 4 x 7″. While it will fit most phones, it will not fit some of the larger brands (especially not the iPhone Plus, X, Notes, etc. – at the time I designed this, these were not released yet). While I love this wallet, my new phone doesn’t fit – which means I’ll be making more soon. In the mean time, you can enjoy this one, just enter the Rafflecopter contest below. Contest runs until Monday, January 22 and can be entered daily! Good luck! This entry was posted in Uncategorized on January 17, 2018 by stacy. Last week we had a snow day because of the ice, today we have one because it’s too cold (as I write this, it currently “feels like” -16), and yesterday was a holiday. What does all this mean for sewing? That I’m not really getting much of anything accomplished! 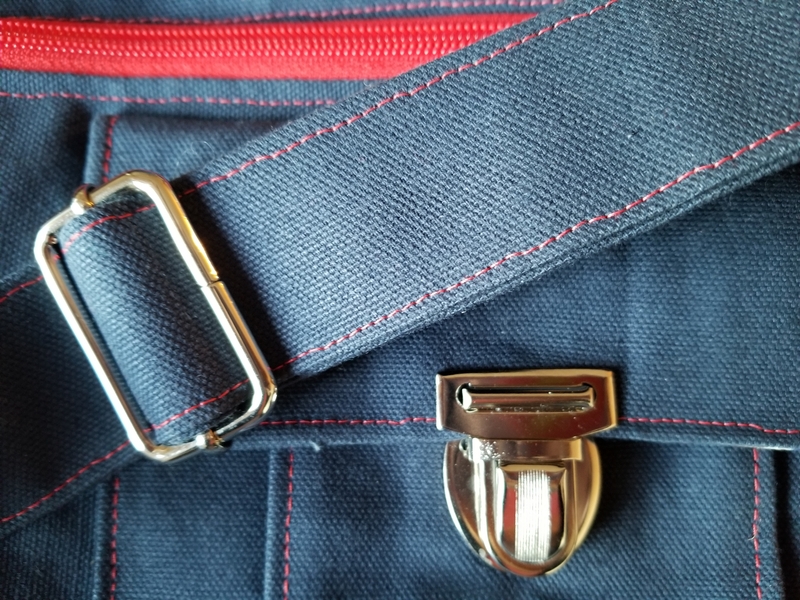 I am doing some behind the scenes sewing that I can’t show you just yet – but this leads me today’s photo…. apparently I am crazy for this print. When it released, I wound up buying 3 different colorways and then bought it in an athletic\swim fabric as well. I can finally say that after yesterday, I’ve used it all! Granted I have some great scraps left over, but there aren’t yards of this print in my stash! Thank goodness I love it as much as what I did when I got it! This entry was posted in Uncategorized on January 16, 2018 by stacy. Without a doubt, this shirt is one of the comfiest that I own. This week I managed to put together Seamwork’s latest pattern, Skipper, and paired it up with a wonderfully soft French Terry to make this shirt (which will probably become a wardrobe staple). This was a great “quick sew” – everything came together nicely (i.e. all the pieces lined up well) and the instructions were very straightforward (honestly, if you’ve made a knit shirt before, you can probably skip the instructions all together). In the end, I did wind up adding a pocket (even though I said that I hated how large it was) – about half way through sewing this up, I realized that adding a pocket added something extra to the shirt and help differentiate the front from the back without having to add a tag. I managed to blend in the pocket well enough that it doesn’t overtly stand out, but I know it’s there! As for the fit, it’s very comfortable. This sweatshirt is meant to be a bit over-sized and boxy, but because my fabric has less structure than Seamwork’s models, mine has a bit of drape looks more flattering (IMHO) when worn. If it wasn’t a snow day yesterday, I would have gone out and tried to find fabric to make a pair of coordinating Shelly leggings so I had an entire outfit ready for the weekend (I’ll be honest, it’s so cold out today, I’m not sure I’ll even do it this afternoon). This entry was posted in Uncategorized on January 12, 2018 by stacy.